Occidental’s newest, largest and most popular dormitory was formally dedicated as Berkus Hall Sunday in recognition of a $5 million gift from David and Kathleen Berkus and their family to create a new technology endowment. 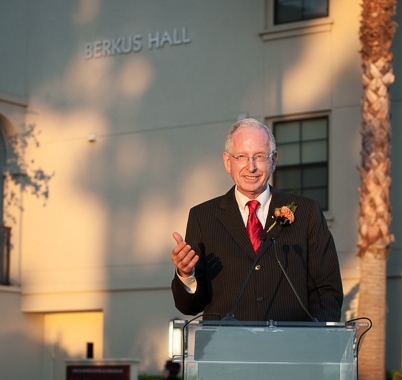 Berkus, a 1962 Occidental graduate and prominent venture capitalist, is a long-time college trustee who as a member of the board’s Buildings and Grounds Committee played a major role in the development of the five-year-old, 274-bed residence hall formerly known as Rangeview Hall. "For 55 years, Occidental has been the beneficiary of the involvement of Dave and his family on every level, from student to trustee," President Jonathan Veitch said during a joyous outdoor ceremony tinged with laughter and showered with confetti. "Their willingness to give of their time, their talent, and their resources has left us deeply in their debt." Although he was considering a gift, it was not this order of magnitude – until the president challenged him to think about a naming gift for the residence hall, Berkus said. "’Impossible!’ is the polite way to characterize my response. But it challenged me. I couldn’t sleep well that night. Or the next night." Berkus singled out Marian Finn, senior director of gift planning, and Shelby Radcliffe, vice president for institutional advancement, for "shepherding me through this complex process to make this happen," said Berkus. "Even though we gave the asset, they gave so much in terms of their time, creativity and resources." Although he graduated just a few months before Occidental acquired its first computer, Berkus has been a major advocate for the creative use of technology at Occidental, Veitch noted. And the demand has never been greater, said Marsha Schnirring, Oxy’s associate vice president for scholarship technology, with a campus that includes 1500 college-supported computers and 500 wireless network access points. The gift from Dave and Kathleen Berkus and children Eric, Matthew, and Amy ’95 "will ensure that Occidental will continue to be a premier educational residential, and technological experience for our students," Schnirring said. There was one other, non-technological reason why Berkus, a Kappa Sigma fraternity member, was interested in naming Rangeview Hall, which sits next to the SAE fraternity house, Veitch said. "When we were talking to Dave about the various possibilities, it was he who suggested this building because, as he said, it looms over the SAE House. As a loyal Kappa Sig, he was very interested in putting his name on something that looks down on the SAEs," Veitch said with sly grin.